Reliable Controls is proud to announce the official release of the MACH-ProZone™. Small, durable and packed with flexibility, the MACH-ProZone™ is a fully programmable BACnet® Building Controller (B-BC) with highly scalable I/O in a very small footprint. The MACH-ProZone™ is ideal for a wide range of applications that include small to mid-sized roof top and heat pump applications, and small mechanical room applications. 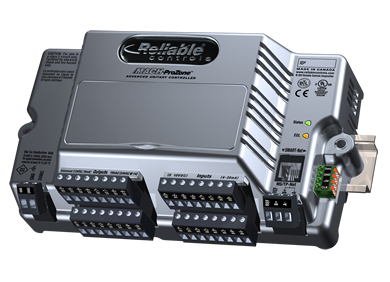 The controller features up to 8 universal inputs and up to 8 universal outputs with jumper selectable TRIAC configuration. The MACH-ProZone™ ships standard with removable connectors and support for 8 SMART-Sensors, as well as an industry renowned 5 year warranty. The MACH-ProZone™ is the third product line to join the Pro-Series of controllers.